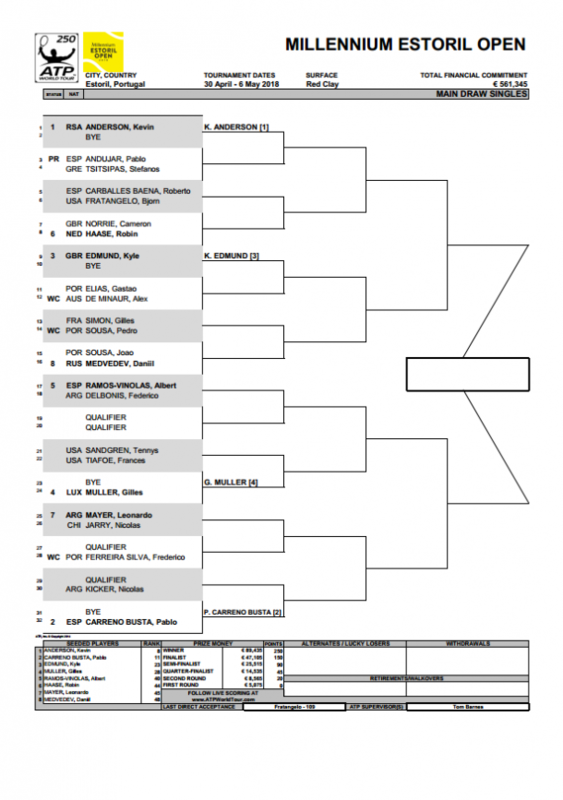 The main draw of the Millennium Estoril Open is out and has some pretty good matches in the first round. 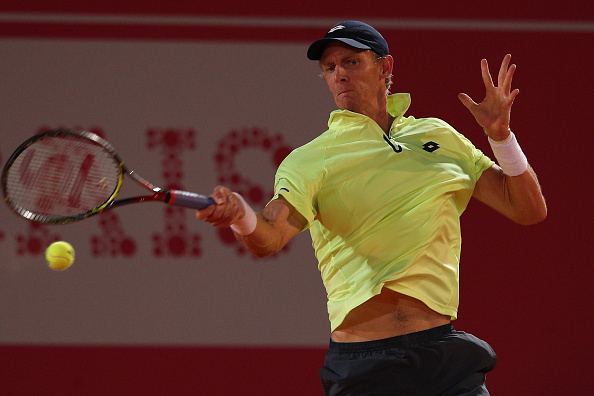 Kevin Anderson is the first seed as Pablo Carreno Busta leads the bottom-half. 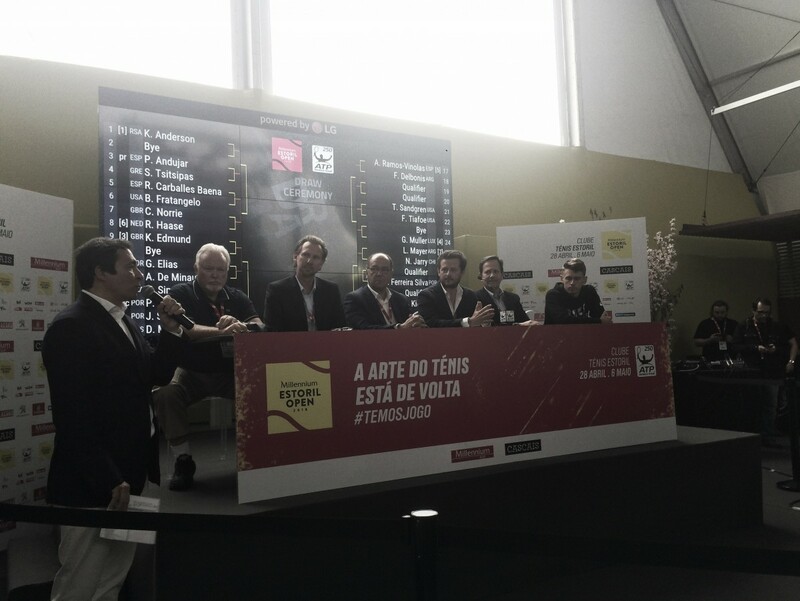 The main draw ceremony of the Millennium Estoril Open occurred this afternoon and there are many good matches in the first round, which will spice up the tournament a little bit. The first seed is Kevin Anderson, currently ranked 8th on ATP, and the second seed is Pablo Carreno Busta, world number 11. The first four seeds are automatically through to the second round, so Kevin Anderson has a Bye and is not going to play the first round. Pablo Andujar and Stefanos Tsitsipas will fight to meet the South-African in the second round. The Spanish player entered the draw using his protected ranking and Tsitsipas is playing the final in Barcelona tomorrow. 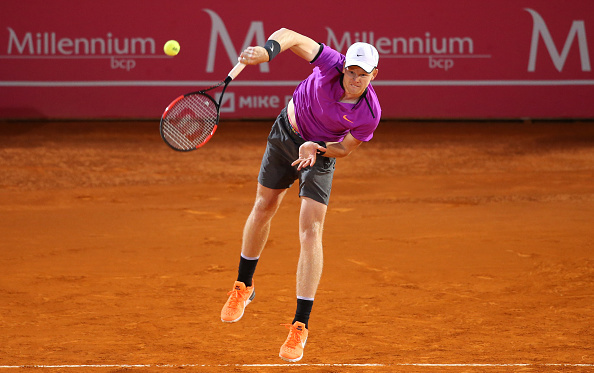 It'll be a very tough match for both as the older player won two titles this season in clay - an ATP World Tour one and an ATP Challenger Tour one -, and the 19 years old boy is playing the final in Barcelona. This will be their first meeting. Roberto Carballes Baena is going to play against Bjorn Fratangelo in their third meeting. Carballes Baena has already won an ATP title this season, in Quito, after passing through the qualifying. The American player has as is best season results the quarterfinals in an ATP Challenger Tour tournament, the second round in Barcelona as a qualifier and the qualification to the main draw at the Miami Open. Their head to head is leveled at one match to each other. Fratangelo won in Bordeaux, France, last season, and Carballes Baena won in Mestre, Italy, three years ago. The winner of this match will face the winner of the match between the sixth seed Robin Haase and Cameron Norrie. This will be the first meeting between the Netherlander and the British player. Haase comes to Estoril in a three-match losing streak and Norrie has successfully qualified for the main draw in three events of his last four. Kyle Edmund is the third seed and leads the second quarter of the draw. The British player is in the second round as the four best-ranked players have a Bye in the first round. The Portuguese Gastão Elias will try to oust the wildcard Alex De Minaur, who is aiming to win a second title in Portugal after he won an ITF Future tournament in the country, last year, to play Edmund in the second round. The two players have never met each other before and De Minaur made a final, in early April, of an ATP Challenger Tour event. Beginning this year he also made semifinal in Brisbane and final in Sydney. Elias reached the second round in Buenos Aires and Rio de Janeiro as a lucky loser. Gilles Simon as the difficult task to play against a home player, Pedro Sousa, a local wildcard. The former world number six won a title to begin his 2018 season, in Pune, where he defeated Kevin Anderson, but since then, his best appearance at a tournament was in Marrakech, where he made quarterfinals. Pedro Sousa is 3-7 this season and his best result of the season was the quarterfinals of an ATP Challenger Tour event, last week, in Tunes, but he had to retire during the match due to abdominal pain. The winner of this match is going to battle against the winner of João Sousa and Daniil Medvedev. Sousa and Medvedev have never met in the past and the Portuguese player comes from making semifinals in Marrakech and losing in the first round in Barcelona. This season, Sousa has already reached the third round in Indian Wells - defeating Alexander Zverev on his way - and the fourth round in Miami - defeated David Goffin 6-0 6-1 on his way. Medvedev won the title in Sydney and reached the quarterfinals in Rotterdam as a qualifier. He also reached the third round in Miami. Gilles Muller is the best-ranked player in the third quarter as well as the fourth seed. The 28th player on ATP is waiting for the winner of Tennys Sandgren and Frances Tiafoe to know with whom he will play. 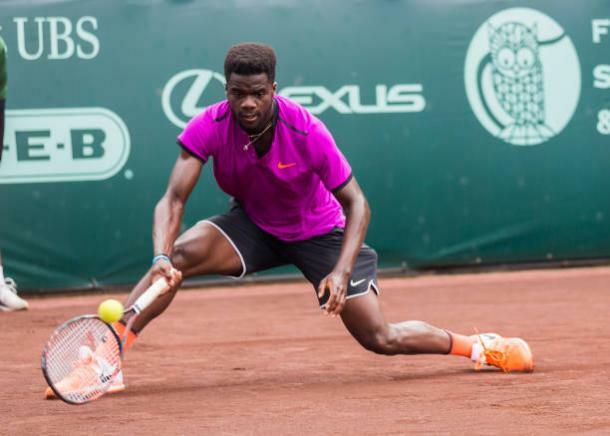 Tiafoe and Sandgren have met each other four times before and Frances won them all. The 20 years old player won the title in Delray Beach, this season, and reached the quarterfinals in New York. In Miami, he made into the fourth round. Two qualifiers will meet in this quarter of the draw and either Albert Ramos-Vinolas or Federico Delbonis will play him in the second round. Ramos-Vinolas and Delbonis are going to meet for the sixth time. The last time they played, Delbonis got the win. He leads their head to head 3-2. The Spanish athlete reached the final in Quito, this season and Federico made semifinals in Buenos Aires. Pablo Carreno Busta is the last name of the draw as he is the second best-ranked player. He leads the fourth quarter of the draw, in which Nicolas Kicker, Frederico Silva, Nicolas Jarry and Leonardo Mayer compete too. Mayer will face Jarry for the second time in their careers. They fought for a place in the second round of the Australian Open, this year, and Mayer won 6-2, 7-6(1), 6-3. The Argentinean reached the fourth round at the BNP Paribas Open this season and Jarry played quarterfinals in Quito, semifinals in Rio de Janeiro and final in São Paulo, where he lost to Fabio Fognini. Frederico Silva awaits a qualifier and he is with a win-loss record of 23-3 in 2018. Carreno Busta will play the winner of Nicolas Kicker, who made third round in Indian Wells and at the Australian Open, and a qualifier. Kevin Anderson is 17-5 this season and although he has played only in hard courts this year, he can make a good adaptation to the clay courts. Pablo Carreno Busta just made semifinal in Barcelona, so he has more match play, what could benefit him. He also loves to play n Estoril and he has the title to defend here.